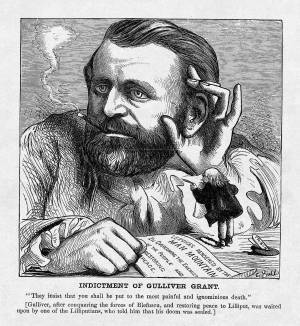 This cartoon contrasts the character and accomplishments of the 1872 rivals for the presidency by depicting Ulysses S. Grant as a giant Gulliver compared to the miniature stature of Horace Greeley the Lilliputian. The artist's main message is the ingratitude of Greeley and other Liberal Republicans toward Grant's indispensable role in preserving the American republic. In Jonathan Swift's Gulliver's Travels the title character saves the Lilliputian people by destroying their enemy's fleet, only to have the jealous and suspicious Lilliputians condemn him to death.